You have been called to the negotiation table for the Peace Summit between Israel and Palestine. 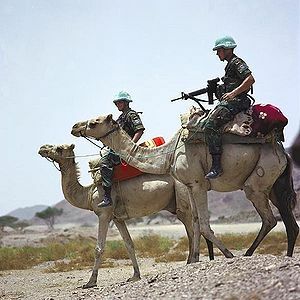 United Nations peacekeeping is a unique and dynamic instrument developed by the Organization as a way to help countries torn by conflict create the conditions for lasting peace. Peacekeepers helps you to improve the English that you need for your career. The site is specially made with personnel of peacekeeping missions in mind. Take a look around and start improving your English! Peacekeeping, is defined by the United Nations as “a unique and dynamic instrument developed by the Organization as a way to help countries torn by conflict create the conditions for lasting peace” It is distinguished from both peacebuilding and peacemaking. “Practise your English while you learn about the United Nations.